To most, Spain conjures up images of sitting at a beach restaurant, drinking sangria, and eating paella. But, Spain is also great in winter, and December may top a hot summer month like August. Many don't realize that it snows in Spain, and it has many more mountains than any other country in Europe, meaning you can go skiing in Spain. You can't beat the Pyrenees, with ski resorts all along the border with France, while for the sheer novelty of skiing in the south of Spain and being able to go to the beach on the same day, the Sierra Nevada is perfect. There are also ski resorts near Madrid, in the northwest of Spain (in Galicia, Leon, and Cantabria), La Rioja, and Teruel. As most avid skiers head for the Alps for skiing, the resorts in Spain are known to be moderately priced. A by-product of the heat of Spanish summers is the fact that many businesses close as staff flee the hot cities for cooler parts of the country. This is especially the case in Madrid and Seville. This means you'll find that many of the best restaurants and bars are closed. There are also fewer art exhibitions and special events because there are fewer people there to see them. In winter, everything is open and there will be plenty to do. Although temperatures vary across the country, summer in Spain can be hot—often too hot. Cities like Seville and Madrid frequently reach temperatures in excess of 100 degrees Fahrenheit (40 degrees Celsius). In winter, temperatures are much more manageable. It can get very cold in the center and the north but Andalusia is pleasantly mild throughout the winter months. Of course, if you plan to partake in winter sports, you should make sure to pack the usual cold-weather clothing and gear. But in the cities, layering is key with a coat, boots or walking shoes, and a winter hat, scarf, and gloves. Weather does vary, so you might not need as much winter-wear in the parts of the country bordering the Mediterranean. As early as October, traditional sweets such as turron, an almond and honey confection, and marzipan appeared in supermarkets. But the real events start in December. Winter in Spain is dominated by Christmas and the New Year, though there are a number of other events going on too. There are celebrations and religious services from mid-December through January 6. There is the giant multi-billion euro lottery, splendid nativity scenes, lots of great food, and one of the biggest New Year's Eve celebrations you are likely to see. Festival de Jerez: This is one of the most important flamenco festivals in Spain. If you're in Jerez a bit earlier, it is a good place to base yourself for visiting the carnival in nearby Cadiz. ARCOmadrid International Contemporary Art Fair: February also sees the ARCOmadrid International Contemporary Art Fair, which includes historic avant-garde and contemporary classical works, along with contemporary art. You're likely to find lower airfare and hotel rates in the winter low season. Keep your eyes out for a good deal. January is the coldest month in Madrid and most of Spain, so make sure to pack extra layers if you visit then versus in December or February. 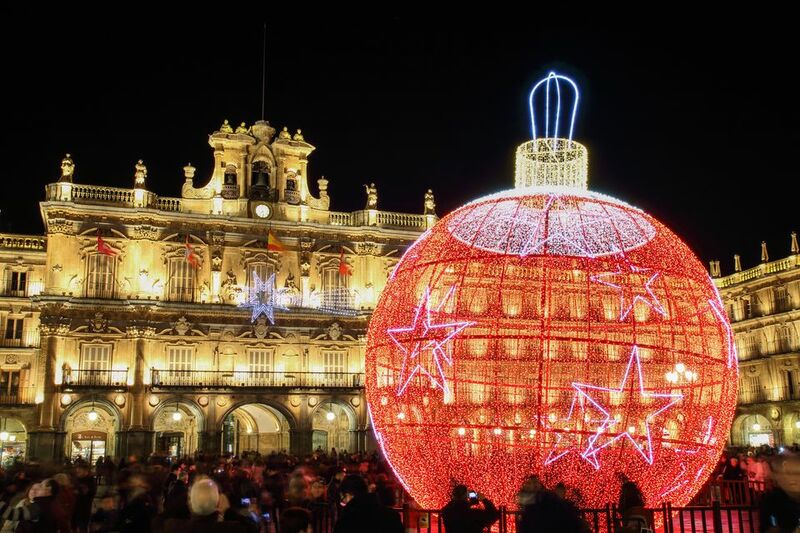 Although Spain isn't known for having European-style Christmas markets, it's still a great place to enjoy the holidays. Just book far in advance to get the best prices on flights and lodging.